From 2010-2015 Hawk Hill’s stable was inhabited always by a horse or two and I ran a tack store out of a warehouse building on the property that was designed to look like a barn, so it seemed appropriate for both my use of the property and the design of the buildings themselves to integrate the equestrian theme with Christmas decorations. 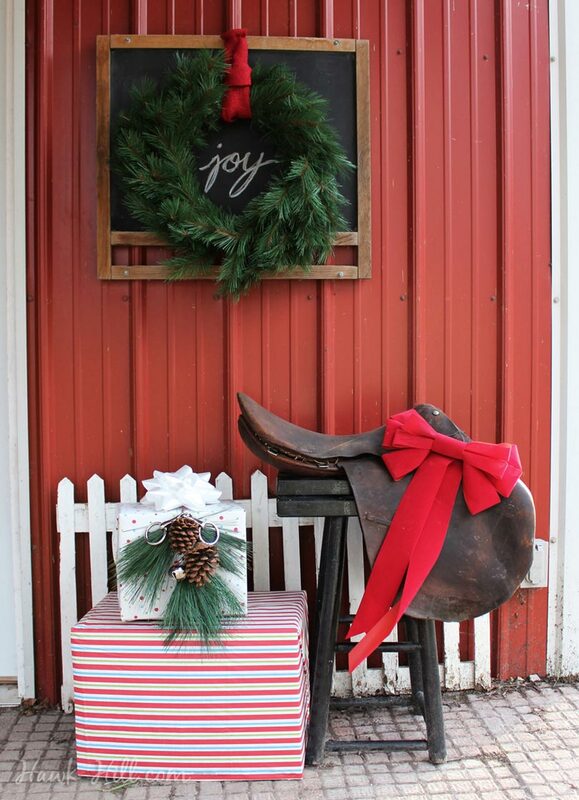 Most of my photos depict distinctively English-riding elements, however this look is easy to convert to western style christmas decorates simply by replacing distinctively hunter/dressage tack to that of western pleasure or rodeo equipment (example: swap out the tall boots for cowboy boots, English saddle for western, etc) to decorate with horse tack, and over the years I got more elements for my equestrian Christmas display. 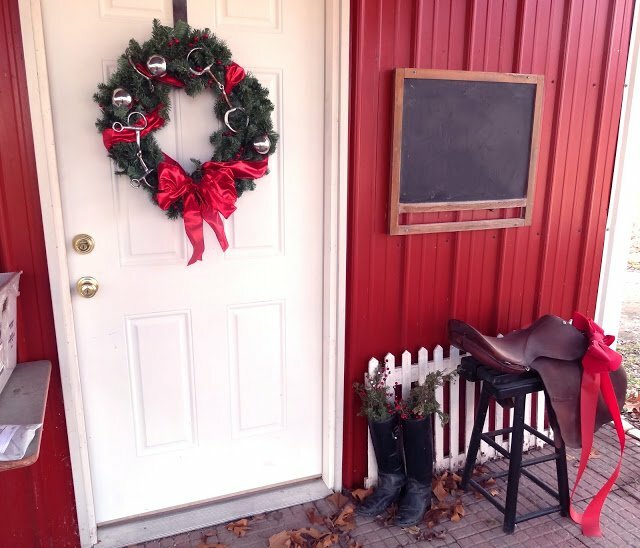 I think this vignette, my tack store’s porch Christmas decor from 2014, is my favorite setup that I created. 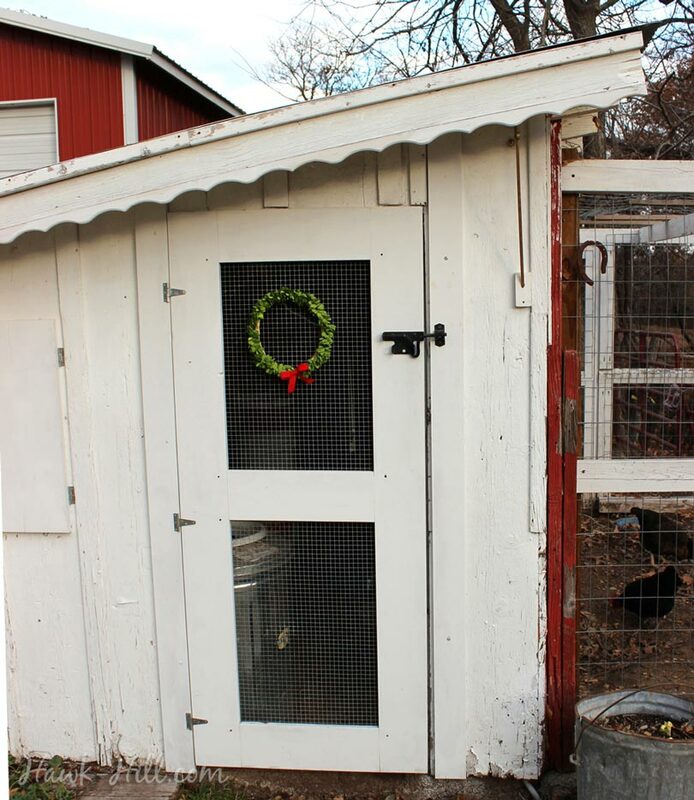 It’s a super-easy way to decorate a front porch or add holiday cheer at the entrance door to your barn, store, or stable. 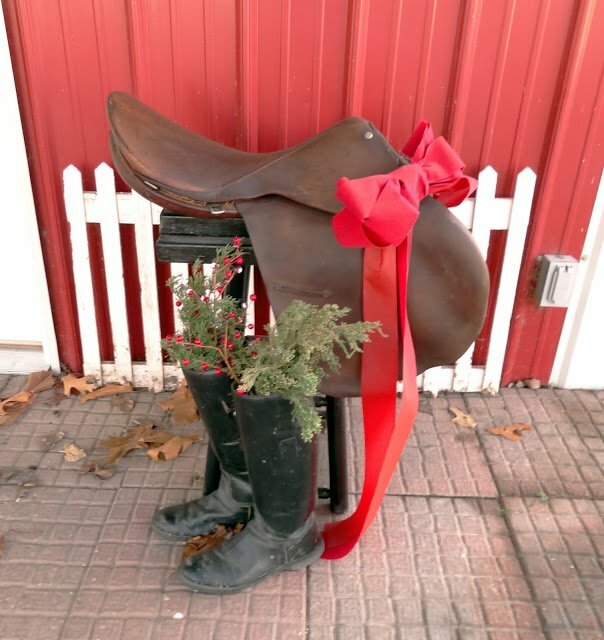 My typical all-season decor included this wreath, picket fence, and this old saddle. 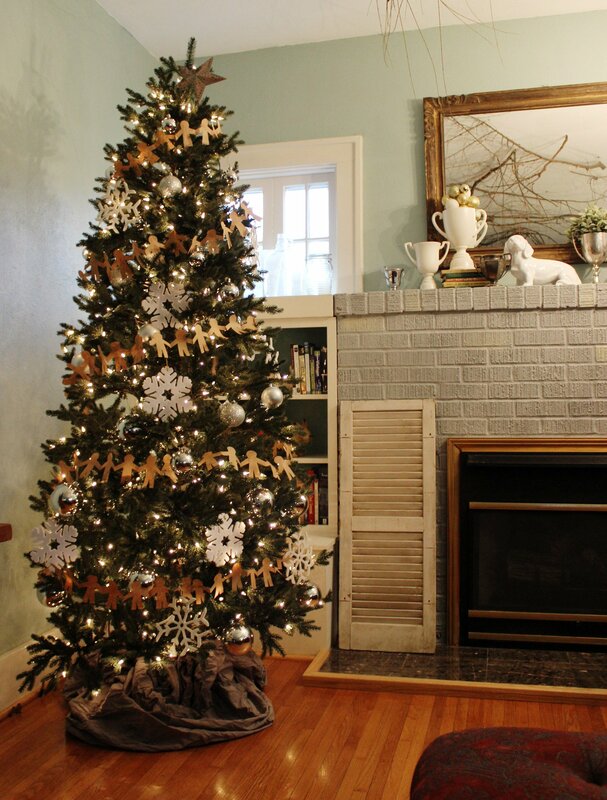 At christmas, I’d add weights to a few cardboard boxes and then wrap the boxes with vinyl table clothes to create a stack of “gifts.” Decorated with a sprig of greenery, pinecones, bells, and a miniature horse bit for a bright, silvery equestrian finish. 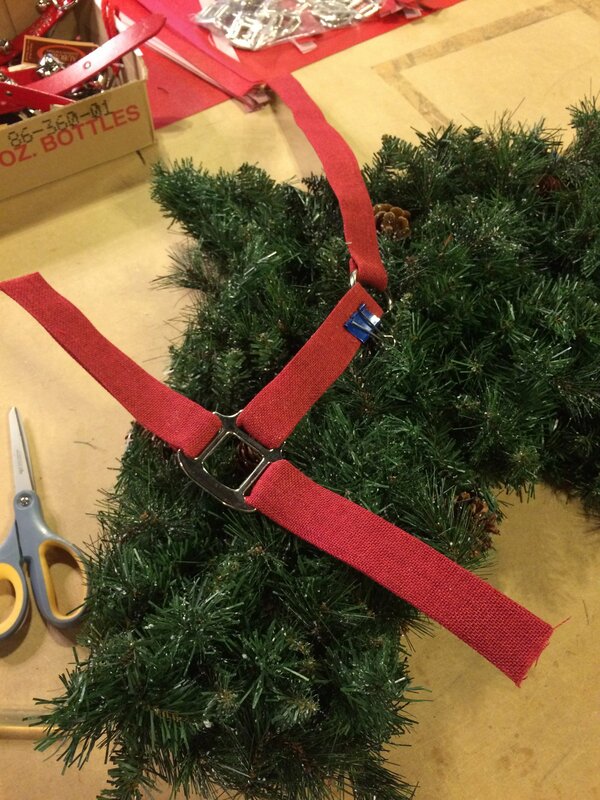 I’d also keey a large gift bow on hand and use floral wire to attach it to the D-rings of the saddle during the holiday season- pairing with the wrapped gifts to create the feel of christmas-morning surprises. decorations in unexpected but appropriate locations. 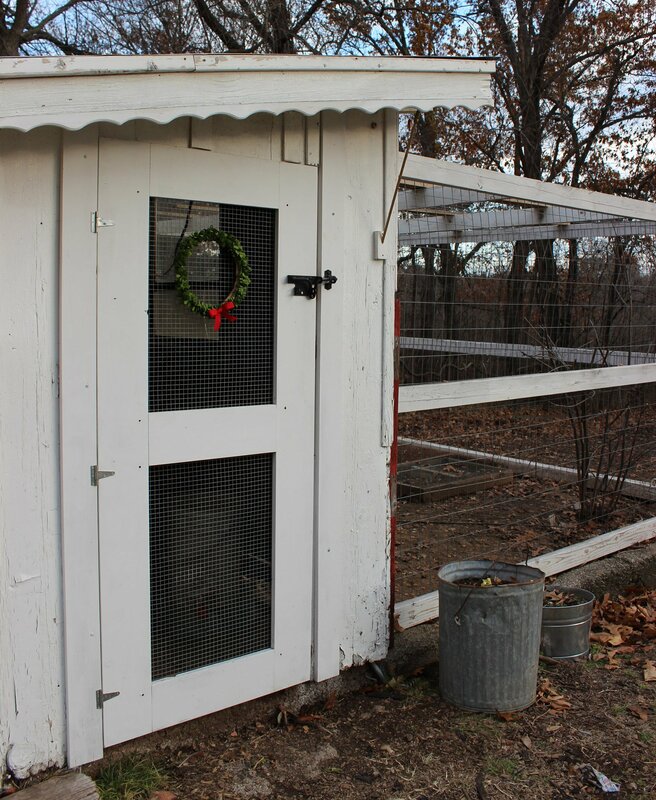 I personally prefer classic looks around the farm, such as this plain wreath with a plain red bow. 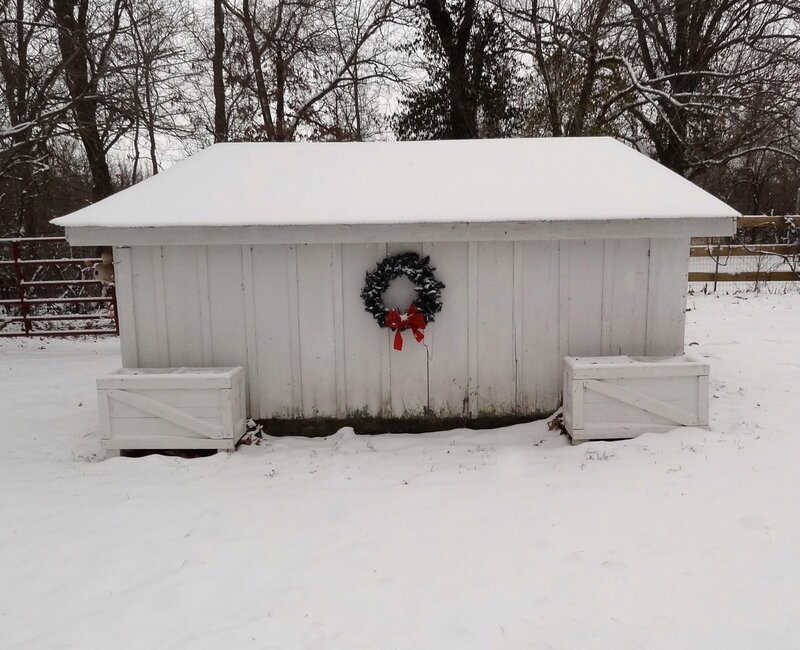 Paired with the stark landscape of winter snow, this classic Christmas decoration adds charm to a traditional chicken barn’s siding and wood planter boxes. I love decorating with elements that many people think are not beautiful or items to decorate with. 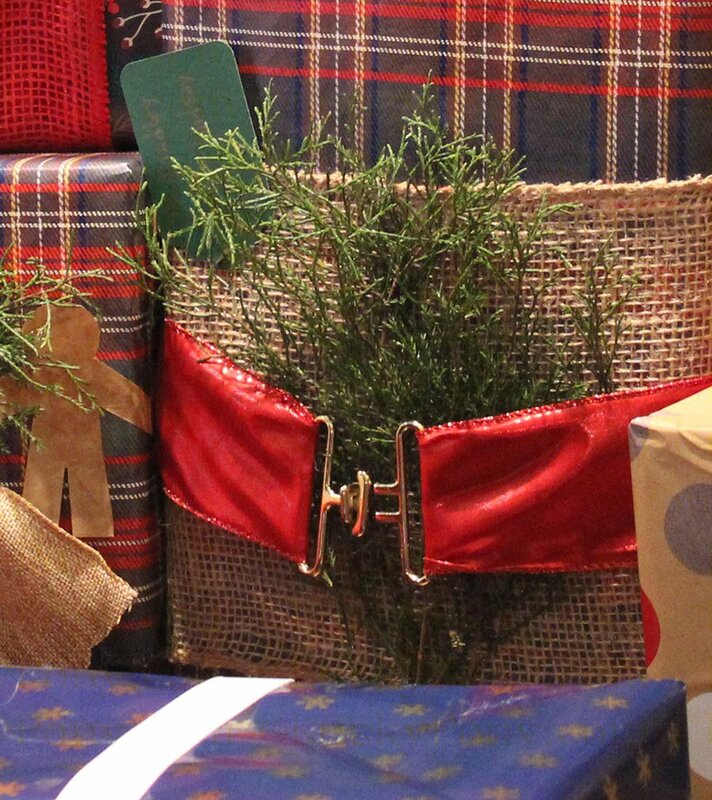 In this photo I’m using faux wool blankets to add warmth and charm to a holiday porch display. I’ve added this photo to this collection because horse blankets in traditional colors and patterns work great for this purpose. 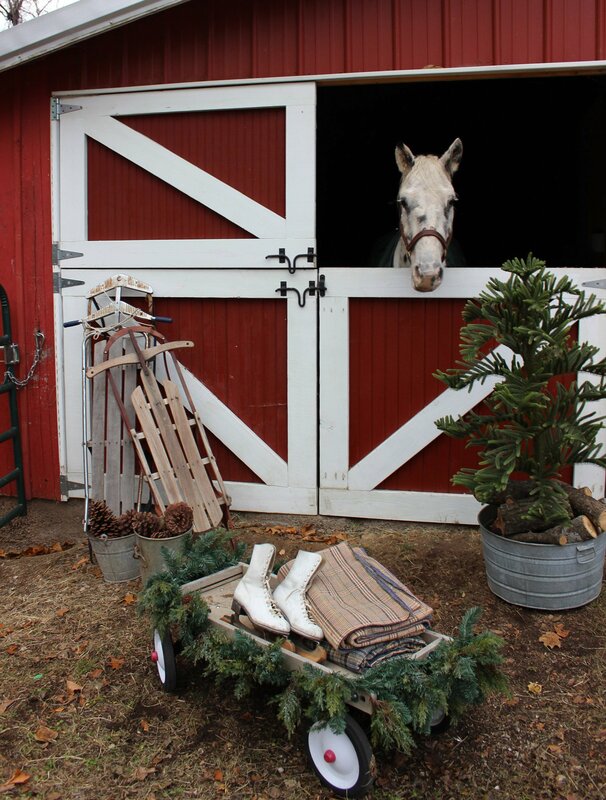 Folded and stacked, the trim and hardware of horse blankets as a distinct equestrian flare to a vignette like this one which shows fake wool blankets paired with a wood bench, vintage buckets of pinecones, vintage ice skates, and a vintage lantern. 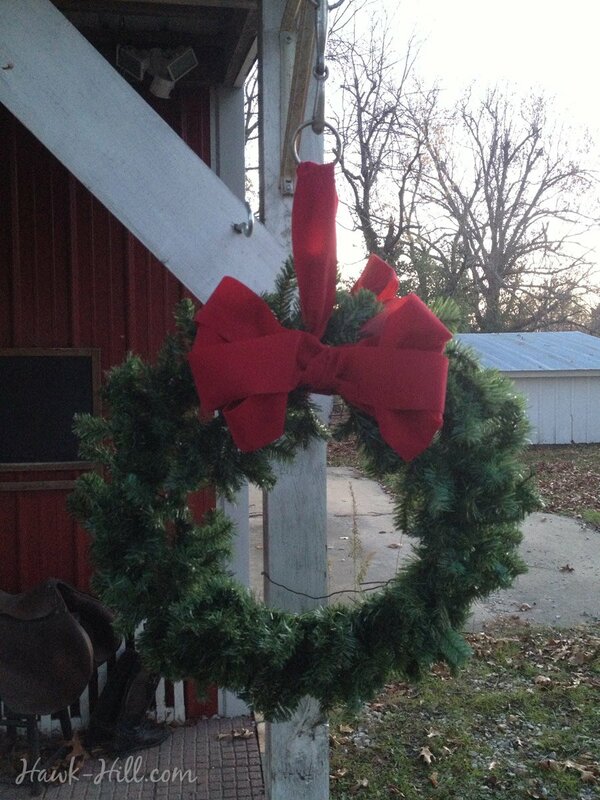 This wreath was a prototype I made and displayed on the front door of my tack store for years. 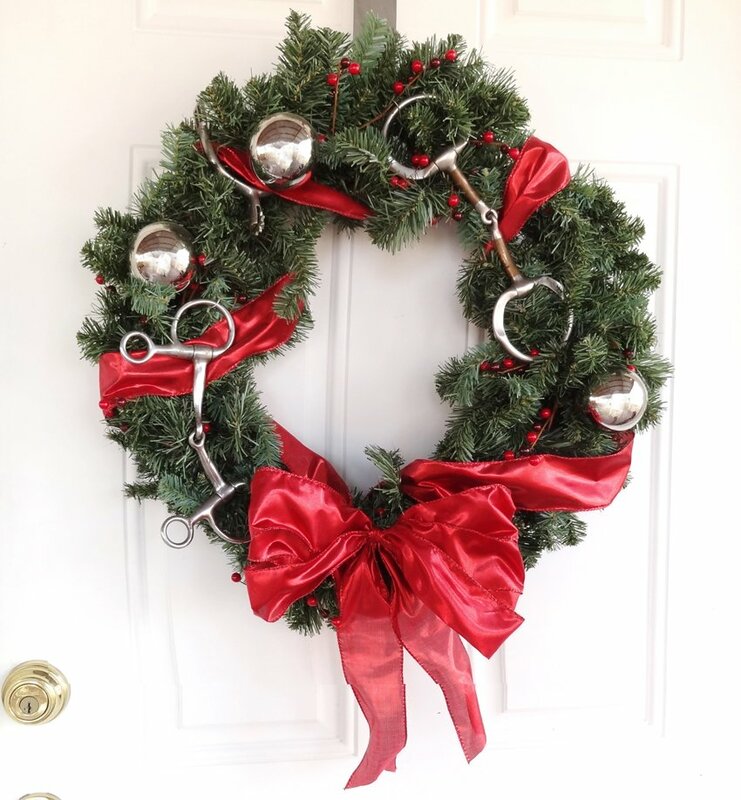 Using a basic wreath from a hobby store, purchased without any decoration, I added silver mirror – finish ornaments, winter berries, and ribbon before adding, atop those things, two full-sized horse bits and one orphan english riding spur. 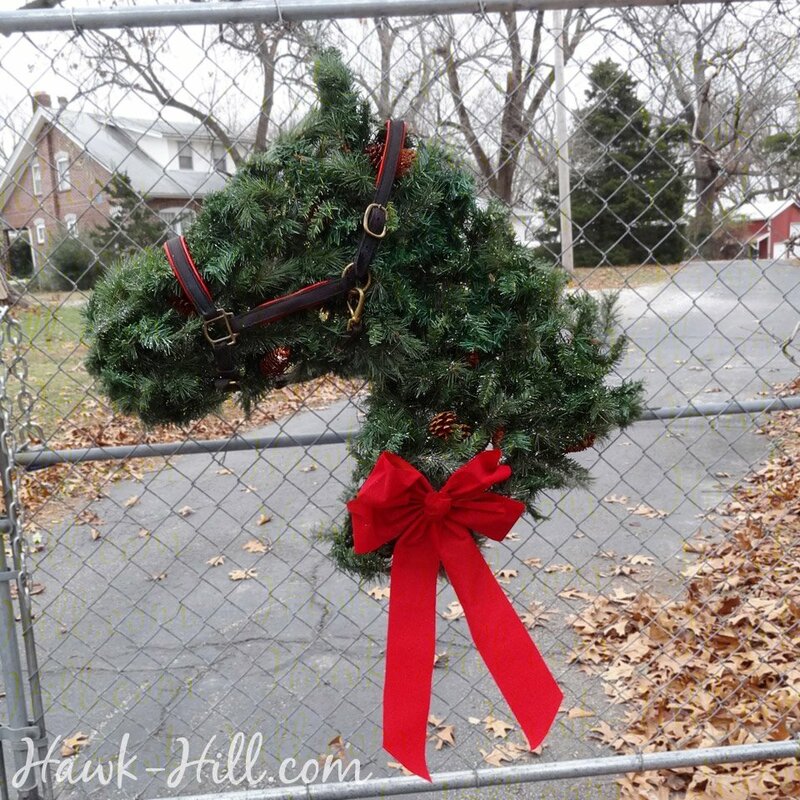 This wreath was a popular seller in my store, but not at all difficult to make for the average crafter – – in fact much easier than my popular horse wreath that I give instructions for making. This photo is from a professional photographer’s photo shoot done on my farm in 2014. Setup as a backdrop for family photos, was compiled by collecting my Christmas decorations from other areas of the property. 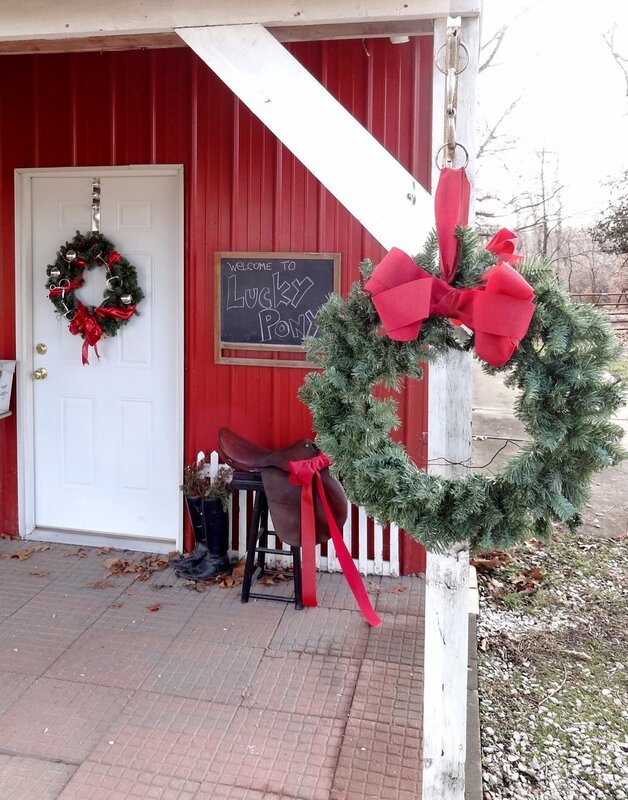 My classic style barn doors in red and white provide a natural backdrop for a Christmasy photo shoot. 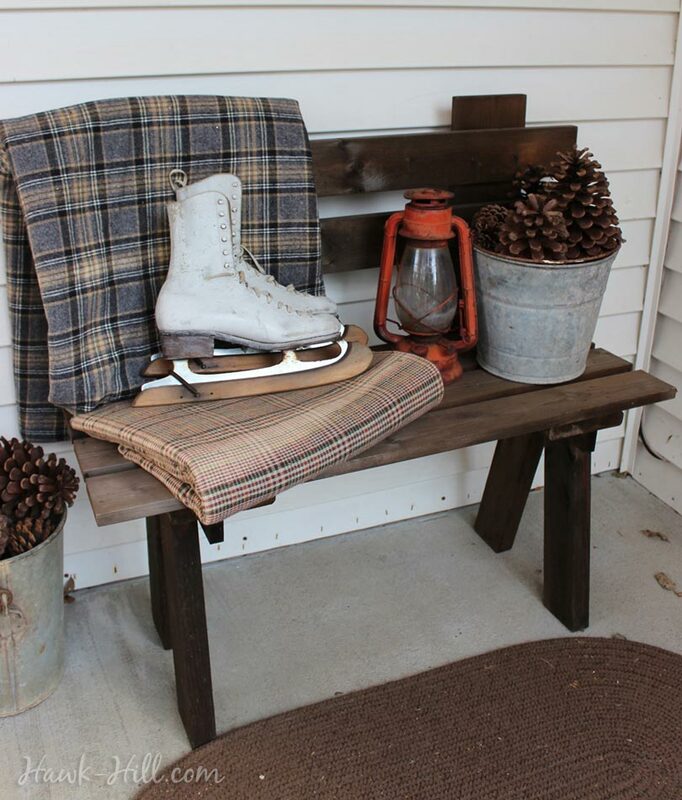 Old wooden sleds, pinecones, are paired with a faux Norfork Pine. To beef it up a little bit the base of this scrawny Christmas tree is placed in an old galvanized metal washtub which is then weighted with firewood. I liked this Norfork Pine as a quirky Christmas tree decorating my porch, and my gelding Hemingway seems to enjoy it in this photo as well. This image shows my saddle and boots the first year I created a display at Christmas using them. In this picture, you can see that my saddle (although it has a broken tree) is still in pretty good shape compared to later photos. I would store this giant bow from year to year to place on my saddle on the porch as if it was a Christmas present. 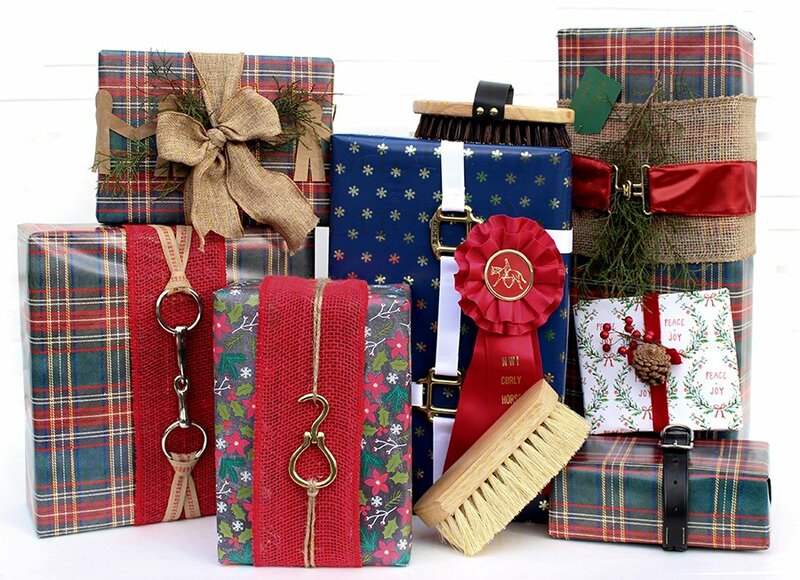 In this photo, horse bits, hoof picks, horse hardware, surcingle buckles, and horse show ribbons are paired with classic textures like burlap and leather and equestrian inspired patterns like plaids to create distinctive equestrian themed wrapped gifts. 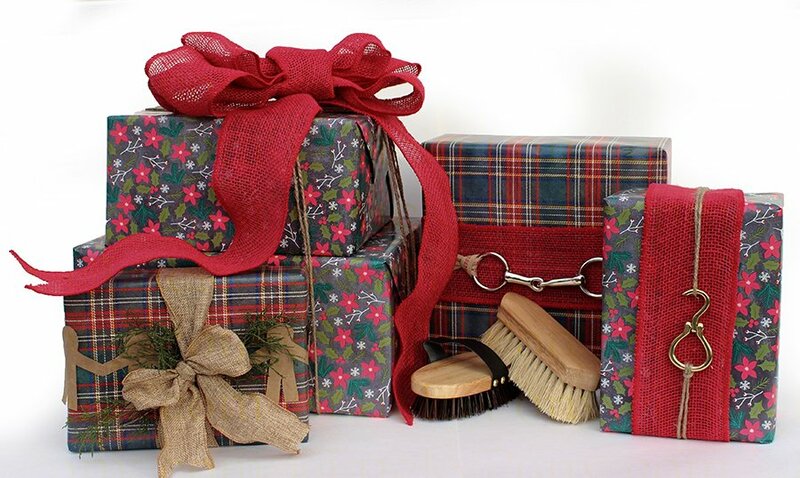 To see more examples and how to create the packages you see here visit my page on wrapping gifts with equestrian style. 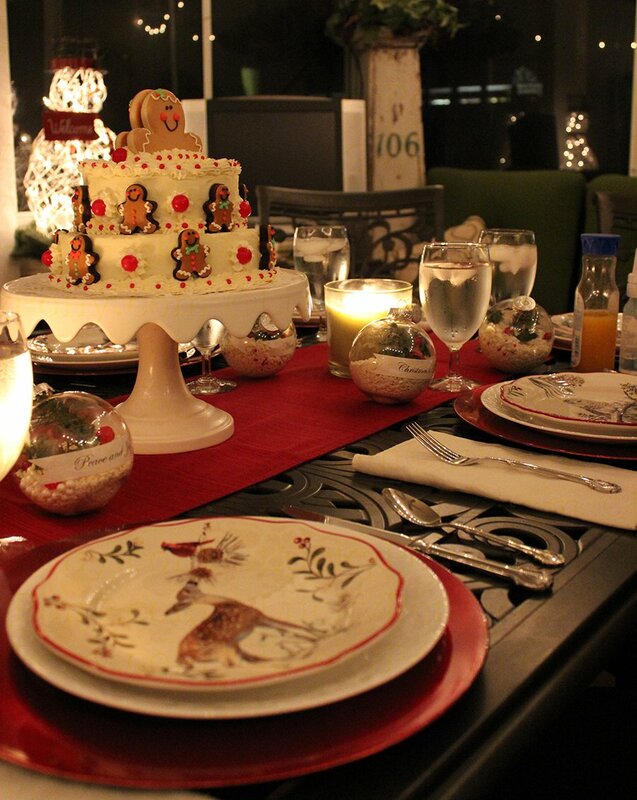 A Christmas table set for a holiday dinner in a rustic outdoor setting. Paired with comfortable seating, linens and table dressings, and outdoor heaters, a clean barn or stable can be a charming location for a holiday dinner. 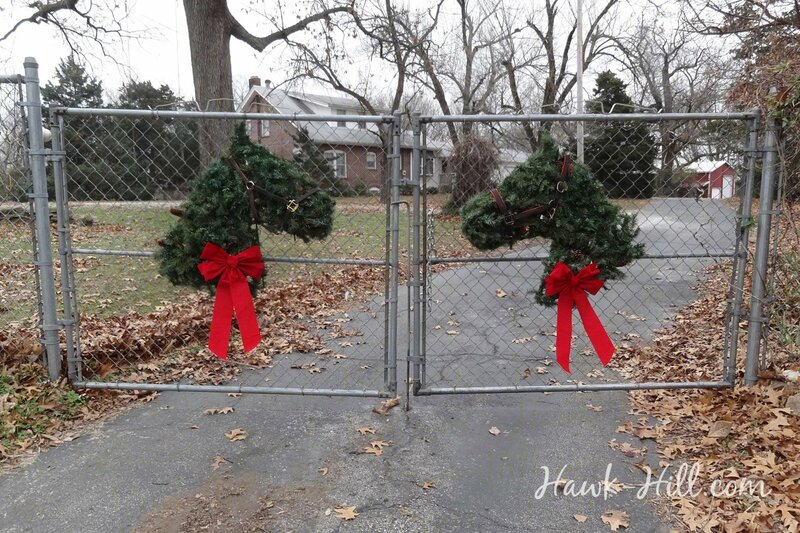 Whether it’s adding a simple bow or creating a horse harness wreath complete with greenery and sprays of holiday decorations, old horse harnesses can be transformed into christmas decorations with just a bit of creativity. 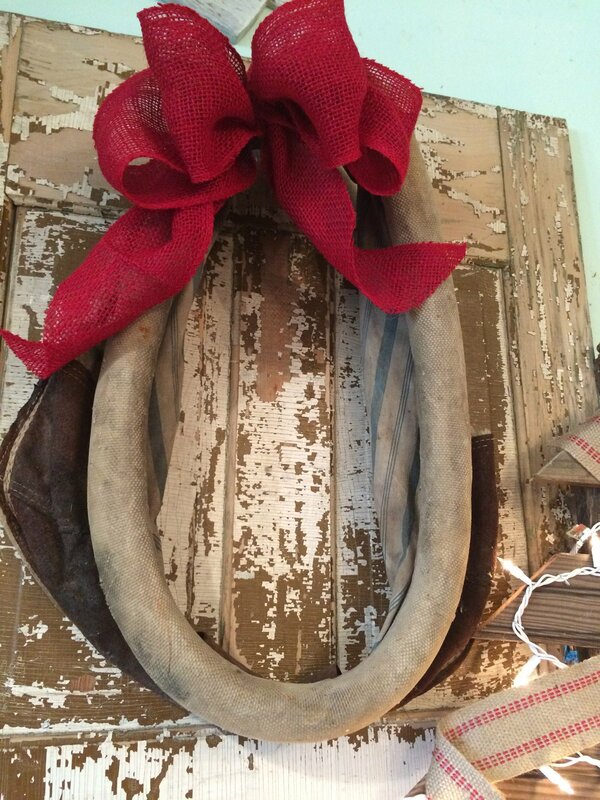 Visit my tutorial on making a wreath from a horse harness. 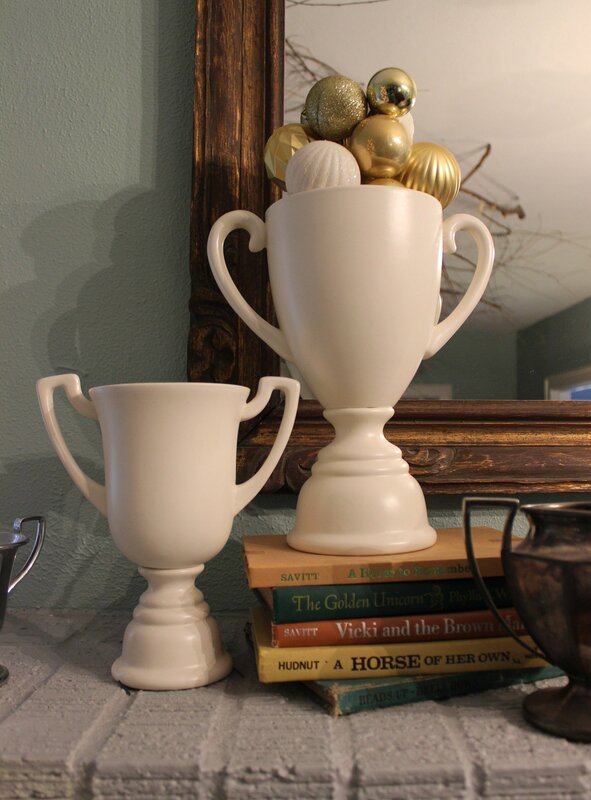 Trophy cups are decorative as standalone items but and also work great as vessels to display other items. I use my trophy cups to display modified Ikea fake plants and/or fresh flowers throughout the year. 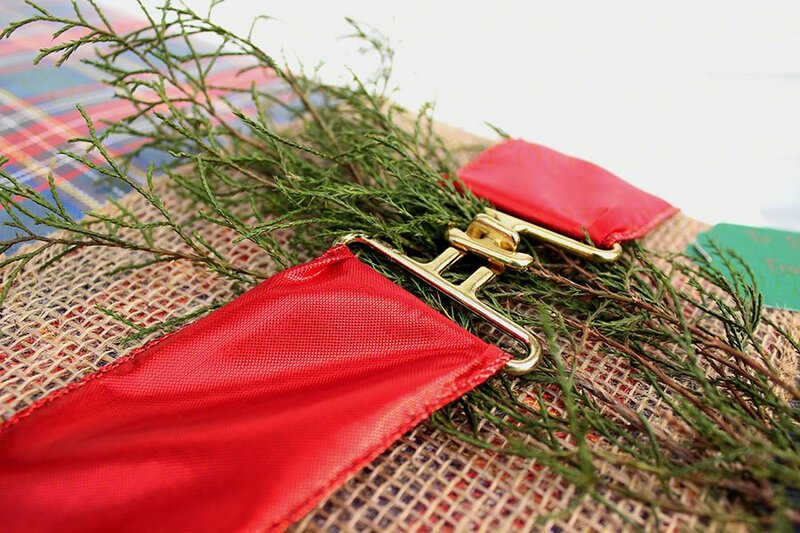 For Christmas, try wrapping a few hardcover books in wrapping paper with classic plaid patterns, then topping the stack with a trophy cup filled with sprigs of evergreen or winterberry springs. If you don’t have trophy cups around (because 1. they’re kinda tough to get and 2. cup-style trophies for some reason I totally don’t approve of fell out of fashion in the late 20th century) you can buy them- and believe me, buying them on Amazon is way cheaper than the training, travel, and show fees it takes to buy trophies the old fashioned way! If you hunt online for decorative versions or second-hand award trophies, try searching with the traditional name for this style of trophy: “loving cup” – after their original use in weddings as a two-handled cup). For a cheaper alternative than actually second-hand trophies, try this unique string of search terms on amazon to locate vases with a trophy cup style look and color. 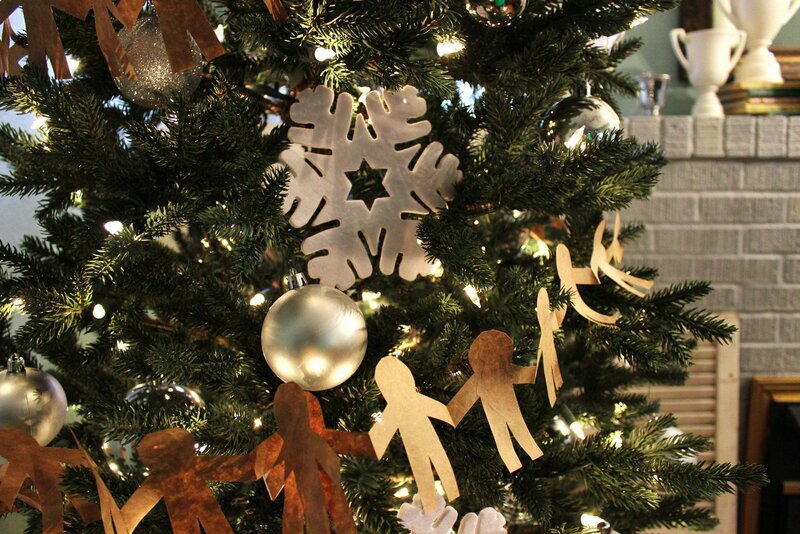 Try staggering 2 or 3 trophies of varying size or color for a more dramatic effect. Placed strategically, or even hung from the ceiling by their attached leathers, stirrups can make elegant candle holders for LED tealights or pillar style flameless candles. Because the stirrup doesn’t make a totally stable surface for the candle, avoid traditiona candles with open flames. 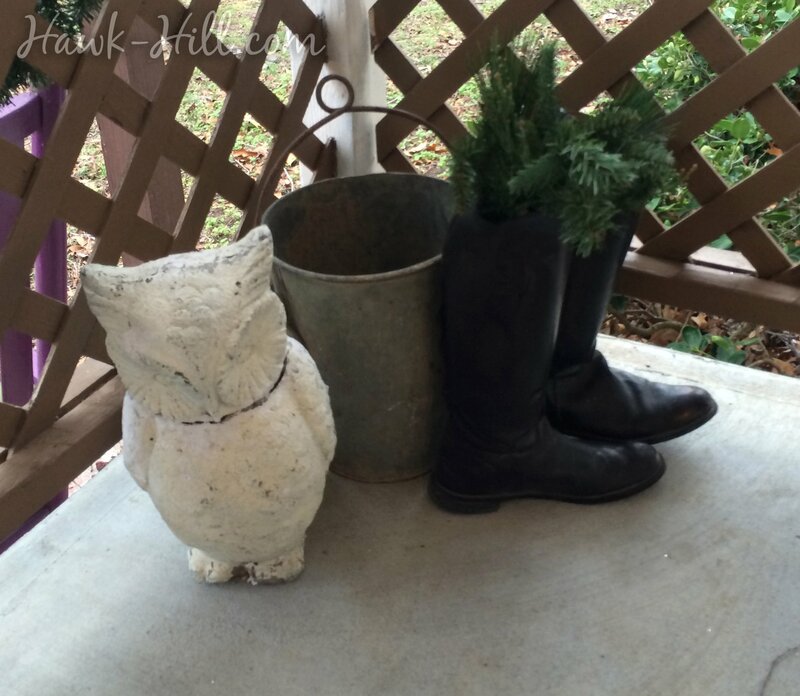 Filed under “use what you have” even well-loved boots can serve beautifully as holders for bright greens and reds of christmas florals. If your boots are a little too worn for display, check out my tutorial on a cheap, 5-minute fix for discolored leather riding boots. Every equestrian has a small library of unused bits. Their silvery finishes make cheerfully bright additions to any equestrian-inspired arrangement of greenery. 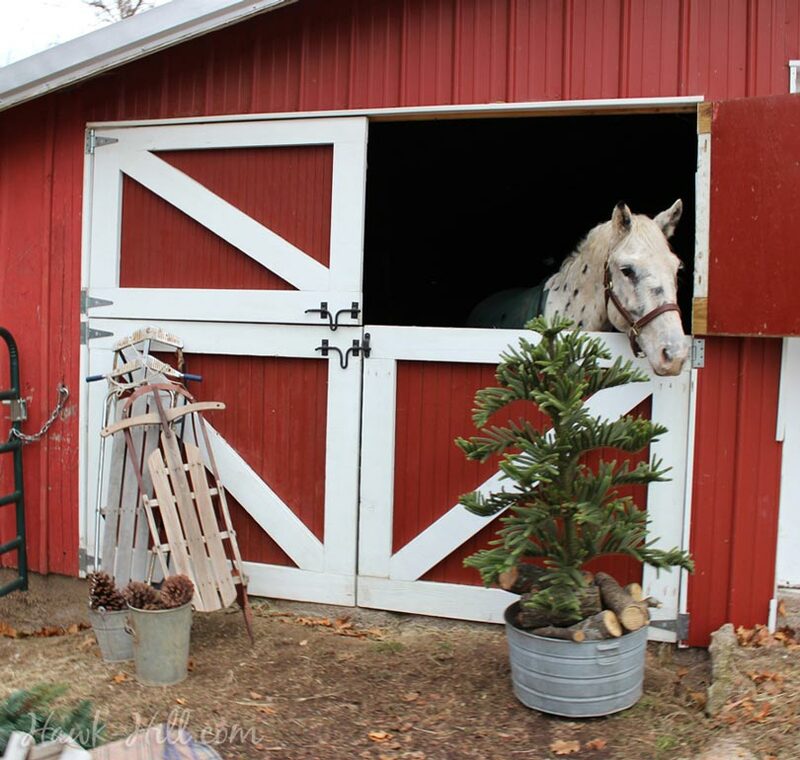 On the front of one of my barns, beams that display buckets of flowers in the summer convert to wreath holders in the holiday season, where wire and ribbon are used to join wreath to snaffle bit in an equestrian display.